R.D. “Bob” Rowe, prominent businessman and community volunteer, passed away on January 30, 2018, just 4 months shy of his 97th birthday. He leaves behind a large and loving family, whose lives he has influenced by his examples of integrity, patriotism, and conviction to always doing what is right. Robert David Rowe, son of Alfred Lewis “Bud” and Alice Lillian “Ally” Ledbetter Rowe, was born in Great Falls, Montana, on May 30, 1921. He graduated from Great Falls High School in 1939 and attended Montana State College where he majored in electrical engineering and was a member of Kappa Sigma Fraternity until World War II interrupted his education. An electrician at the time, he worked on the first building project at East Base, now Malmstrom Air Force Base, and continued working on defense projects throughout out Montana until 1945. Joining in 1938, he was an 80 year member of the International Brotherhood of Electrical Workers. He entered military service in 1945, serving first in the infantry where he was awarded the Expert Infantryman’s Badge and served as trainee Platoon sergeant and Platoon Sergeant for Overseas Shipment aboard ship. On arrival overseas he was transferred to the 972nd Signal Service Battalion where he was promoted from Private to Battalion Sergeant Major in just six months. He received the Good Conduct Medal, Asiatic Pacific Service Medal, Meritorious Unit Award, Victory Medal and was honorably discharged in June, 1946. Bob married Esther Livingston in 1940. They divorced in 1948. He was married to Maureen Carpenter from 1952 until her death in 1975. He married Leila Fifer Chapman in May, 1983. Leila died on January 10, 2018. After receiving an Honorable Discharge from the Army, he joined his father in the operation of Rowe Electric Co., an electrical contracting firm, and the Falls Supply Co. Inc., a wholesale electrical supply company which he subsequently purchased in 1952. He served as President and General Manager until the sale of the business in 1979. He was a partner/manager of the Rainbow Hotel from 1980 until 1983. During his professional career he served as President of the Montana Chapter and was a member of the Board of Governors of the National Electrical Contractors Association. He served as the first chairman of the Montana Area National Association of Electrical Distributors. Civic minded, he was a lifetime member of the Elks Lodge and was honored as “Elk of the Year” in 2003. Bob was a charter and life member of the Optimist Club of Great Falls. 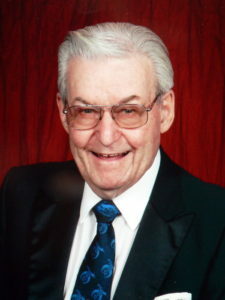 He served as President of that club and District Governor of the Alberta-Montana-Saskatchewan District where he earned the Distinguished Governors Award. He was elected and served as International Vice-President of Optimist International. In 1977, he served as President of the Great Falls Area Chamber of Commerce. Fraternally, Bob is a life member of Delta Masonic Lodge, Scottish Rite Bodies of Great Falls, Algeria Shrine Temple of Helena and the DeMolay Alumni Association. He was a member of the DeMolay Legion of Honor, Royal Order of Scotland and Royal Order of Jesters. He served as President of the Montana East-West Football Game Association, and was founder of the Montana Shrine “Open” Golf Tournament and served as the director of that fundraising event for Shriners Hospital for Children for its first ten years. In 1974, he served as Venerable Master of the Scottish Rite and was Potentate of Algeria Shrine Temple in 1984. His slogan as potentate was “Go with Rowe in Eighty-Fo”. He was invested with the Scottish Rite Knights Commander of the Court of Honor in 1973, was coroneted an Inspector General Honorary 33rd Degree Scottish Rite Mason in 1989 and was Shriner of the Year 2004. Bob served as chairman of the Great Falls Republican Committee, vice-chairman of the Cascade County Republican Central Committee and was a candidate for the Montana House of Representatives in 1964 and 1988. He was president of the Great Falls Pachyderm Club and charter president of the Montana Federation of Pachyderm Clubs. He was awarded the Pachyderm Meritorious Service Award, the club’s Tough Tusk Award and was the second person to receive the National Pachyderm’s highest honor, the Tough Tusk Award. Bob is survived by sons, Jeffrey (Debra) and Kelly (Sallie) of Spokane, Gregory of Lakewood, CO; daughter, Eileen (Ken) Salo of Helena; daughter-in-law, Karen (Jim) Kernaghan; step-daughter, Colleen (Ron) Simonetti; sister, Ally Lou Baker of Great Falls; brother, Charles (Eugenia) of Newark, DE; 16 grandchildren, 17 great- grandchildren and 2 great-great grandchildren. He was preceded in death by his sister, Edithann Janetski; wives, Maureen Rowe and Leila Rowe; and son, Barry Rowe. The family is planning a celebration of Bob’s life later in the spring. In lieu of flowers Bob and his family would appreciate memorials made to the Great Falls Scottish Rite Childhood Language Disorders Clinic at 1304 13th Street South, Great Falls, MT 59405. Bob’s family would like to extend our heartfelt thanks to the staff at the Grandview for the loving care he has received while living there for the last two years.